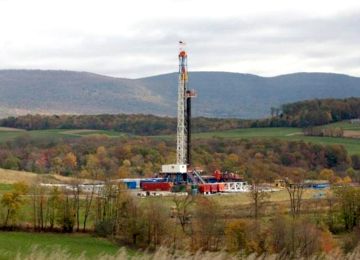 What Happens When Your Land Gets Fracked? 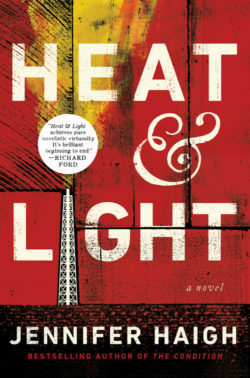 Novelist Jennifer Haigh talks about her powerful new book, Heat and Light. It’s about what happens to a small Pennsylvania community when the frackers come to town. Then Andrew Nikiforuk tells the true story of Jessica Ernst, a Canadian oil patch consultant turned anti-fracking activist. 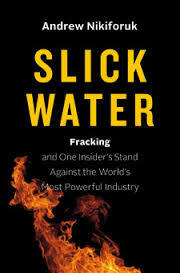 We talk with him about his book, Slick Water: Fracking and One Insider’s Stand Against the World’s Most Powerful Industry. You’ve probably seen the videos where the guy lights the water from his kitchen faucet on fire (if not, scroll down.) Methane from fracked gas well near his house leaked into his well. Contaminating wells and the water table isn’t the only threat fracking brings to a community when the drillers come to town. There are other environmental dangers, of course, like noise, earthquakes, and methane leaks that affect not just communities but our planet — methane is 25 times more potent a greenhouse gas than CO2. But the social fabric of a community can also fracture when gas and oil companies come with their offers of riches to people who have been struggling for years just to get by. The leases they offer to drill on land promise at first to bring wealth to farmers and workers who have seen agriculture prices plummet and good jobs disappear for several generations. That’s what happened to people in Jennifer Haigh’s fictional town Bakerton, Pennsylvania, based on the coal town she grew up in. The mining jobs went overseas and all that’s left are low wage jobs in prisons and nursing homes. Bakerton is the setting for several of her novels chronicling the hidden injuries of class in rust belt America. Her new novel Heat and Light is the latest — and possibly the best — of her wonderful books. Heat and Light was called “the best fracking novel ever” by the Washington Post. It examines what happens when people are driven to make choices that end up creating unintended consequences for themselves and others: the prison guard who desperately needs money to fulfill his dream of being a dairy farmer like his father; his neighbors, organic dairy farmers whose livelihood is threatened by fracking even before the drilling rigs appear; the anti-fracking activist who doesn’t fully consider the impact of his activism on the people he claims to help. Nothing is simple when people without power are forced to make cruel choices by those who holds the reins. Jennifer Haigh is the author of four previous novels, including FAITH and THE CONDITION and the short story collection NEWS FROM HEAVEN. We’ve interviewed her about those books earlier on Writers Voice. When Jessica Ernst began her career as an oil patch consultant, she never imagined that she would end up on the other side of a lawsuit from her former clients. They include EnCana, one of the world’s biggest natural gas producers. When EnCana started using a risky method of fracking for natural gas in Canada’s Alberta province, called slick water fracking, the company ended up contaminating a shallow aquifer used by a rural community with natural gas and toxic chemicals. Jessica Ernst lives in that community. When her well water became toxic, she sued her former clients for violating the law — and regulatory agencies for letting them do it.